^ Sahney, S., Benton, M.J. and Ferry, P.A. Links between global taxonomic diversity, ecological diversity and the expansion of vertebrates on land (PDF). Biology Letters. 2010, 6 (4): 544–547. PMC 2936204. PMID 20106856. doi:10.1098/rsbl.2009.1024. ^ Thompson, John N. The coevolutionary process. Chicago: University of Chicago Press. 1994 [2009-07-27]. ISBN 0-226-79760-0. ^ Darwin, Charles. On the Origin of Species 1st. London: John Murray. 1859 [2009-02-07]. ^ Darwin, Charles. On the various contrivances by which British and foreign orchids are fertilised by insects, and on the good effects of intercrossing 2nd. London: John Murray. 1877 [2009-07-27]. ^ Lodé, Thierry. La guerre des sexes chez les animaux, une histoire naturelle de la sexualité. Paris: Odile Jacob. 2007. ISBN 2738119018. ^ G. S. van Doorn, F. J. Weissing. Ecological versus Sexual Selection Models of Sympatric Speciation: A Synthesis (online, print). Selection (Budapest, Hungary: Akadémiai Kiadó). April 2002, 2 (1-2): 17–40 [2009-09-15]. ISSN 1585-1931. doi:10.1556/Select.2.2001.1-2.3. 1588-287X. The intuition behind the occurrence of evolutionary branching of ecological strategies in resource competition was confirmed, at least for asexual populations, by a mathematical formulation based on Lotka–Volterra type population dynamics. (Metz et al., 1996). ^ 10.0 10.1 Brown James H., Kodric-Brown Astrid. Convergence, Competition, and Mimicry in a Temperate Community of Hummingbird-Pollinated Flowers. Ecology. 1979, 60 (5): 1022–1035. doi:10.2307/1936870. ^ 11.0 11.1 11.2 11.3 11.4 11.5 11.6 11.7 11.8 11.9 Stiles, F. Gary. Geographical Aspects of Bird Flower Coevolution, with Particular Reference to Central America. Annals of the Missouri Botanical Garden. 1981, 68 (2): 323–351. doi:10.2307/2398801. ^ National Geographic. 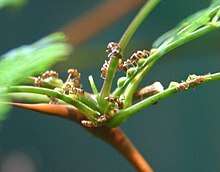 Acacia Ant Video. （原始内容存档于2007-11-07）. ^ Palmer TM, Doak DF, Stanton ML, Bronstein JL, Kiers ET, Young TP, Goheen JR, Pringle RM. Synergy of multiple partners, including freeloaders, increases host fitness in a multispecies mutualism. Proceedings of the National Academy of Sciences of the United States of America. 2010, 107 (40): 17234–9. PMC 2951420. PMID 20855614. doi:10.1073/pnas.1006872107. ^ Britt, Robert. The New History of Black Holes: 'Co-evolution' Dramatically Alters Dark Reputation.